The Morgul Lord. What will he look like? Asmus Toys recently announced on their Facebook page their intention to produce an entire line of The Lord of the Rings figurines. They will produce five years of figures, and already 20 are in production. 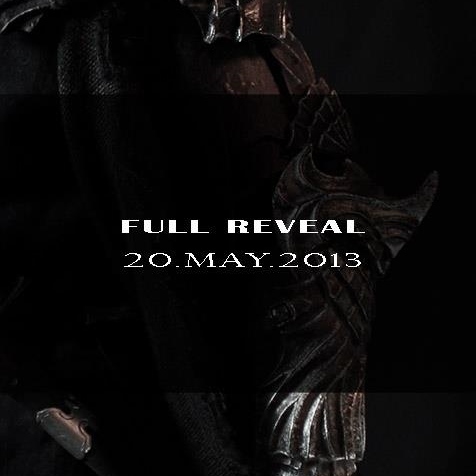 On May 20, 2013, the mysterious figure above, the Morgul Lord, will be revealed, and the toys will go on sale. This line of products will be broken down into four categories: Heroes of Middle-Earth, Man of West, Army of Mordor, and Armors in the Battlefields. The following, found on the Asmus Toys website gives more information about the different categories. Heroes of the Middle-Earth will be the premier line of important characters. Presented by well know heroes such as Aragorn, Gandalf...etc, who will be built in top quality head sculpt, realistically accurate clothing, and mixed media accessories. Each hero will have its own custom base, and together they will be puzzled into a huge battle field diorama. Also, heroes don’t necessarily have to be the good guys. Man of West and Army of Mordor will feature the soldiers from both side of the force. Some of the familiar faces we see in the movies but not as important as the heroes. Examples like Urakais, Orcs and even Merry and Pippen.